Crisp. Cobbler. Crumble. It’s a veritable culinary jumble. Can someone tell my why such similar desserts must distinguish themselves with completely different names? Not wanting to be politically (dessert-ically?) incorrect, I tried to figure out the difference for myself. Turns out crisps and crumbles are essentially identical except one has oats and one doesn’t. But depending on the source, which one is which is up for debate. Cobblers at least, stand apart, being topped with biscuit dough and all. There’s also Slumps and Grunts and Buckles and Brown-Bettys, which are all, essentially, some variation of a baked fruit and pastry dessert. Crumble sounded the best to me, and so Crumble it shall be. This is one of those mutant desserts that simply works. 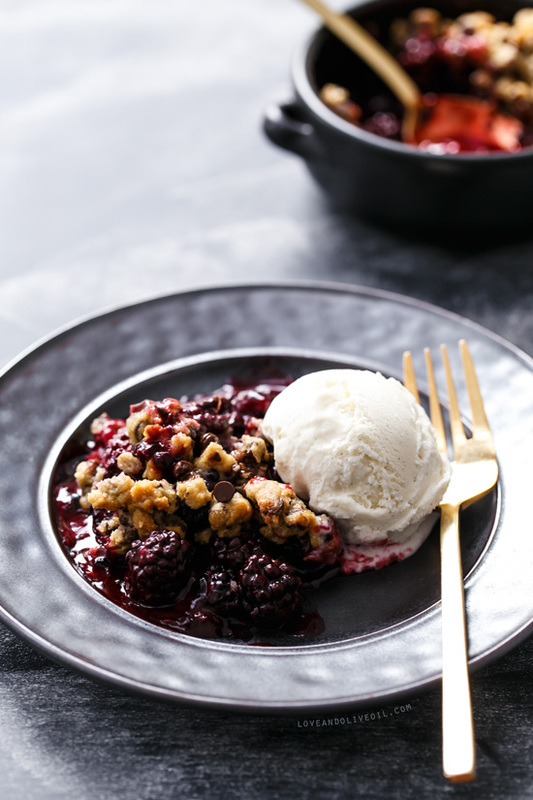 Crumble/cobbler/crisp meets oatmeal chocolate chip cookie, and the results are beautiful. While the combination of baked fruit and chocolate may not seem like an acceptable pairing, the unexpected pockets of chocolate are equal parts surprise and delight. The fruit softens and sweetens and bubbles over with juices as it bakes, the oatmeal cookie topping turning a robust golden brown. 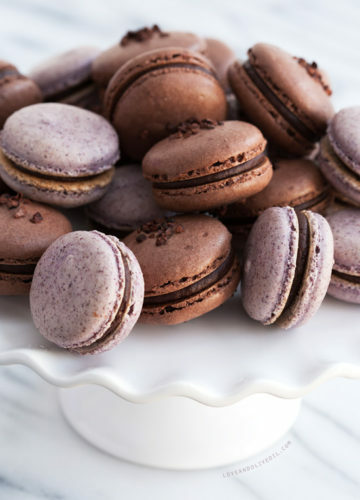 Soft and crisp, salty and sweet, fruit and indulgent chocolate. It’s a dish of bold contrasts, and yet also one of perfect harmony. This winter was hard on Tennessee fruit, and our favorite orchard was pretty much wiped out. In years past I’ve reveled in quarts of the sweetest blackberries you’ve ever tasted, and they’ve made their way into everything from lemonade to applesauce. This year seems to be filled with blueberries and peaches, but I didn’t want to go an entire summer without enjoying at least a few blackberries. So while we were out filling buckets with blueberries a few weeks ago, we bravely ventured into the blackberry brambles, braving the bugs and the overgrowth to pick a precious quart of berries. Most of those berries, aside from the sweet few that we devoured on the drive home, made their way into this crumble. This particular batch of berries was unpredictable, some sweet and some surprisingly tart. So whereas with other berries I’d rely more on the natural sweetness of the fruit, here the sugar is necessary. Although you are welcome to adjust the sugar in this recipe based on the relative tartness of your berries, it won’t affect the overall outcome. Serve this warm with a scoop of vanilla ice cream, a cool and creamy contrast to the warm fruit and chocolate. And as is melts and mingles with the fuchsia-hued berry juices, you’ll wonder how you ever lived without this in your life. And I’m right there with you. To prepare filling, toss blackberries with flour, sugar, and lemon juice. Divide filling among four 6-ounce or two 12-ounce ramekins and arrange on a baking sheet (to catch any overflow). To make topping, beat butter and brown sugar with an electric mixer on medium-high speed until light and fluffy, 2 to 3 minutes. Mix in vanilla. Add oats, flour, and salt and mix until incorporated. Dough will be slightly crumbly. Stir in mini chocolate chips. 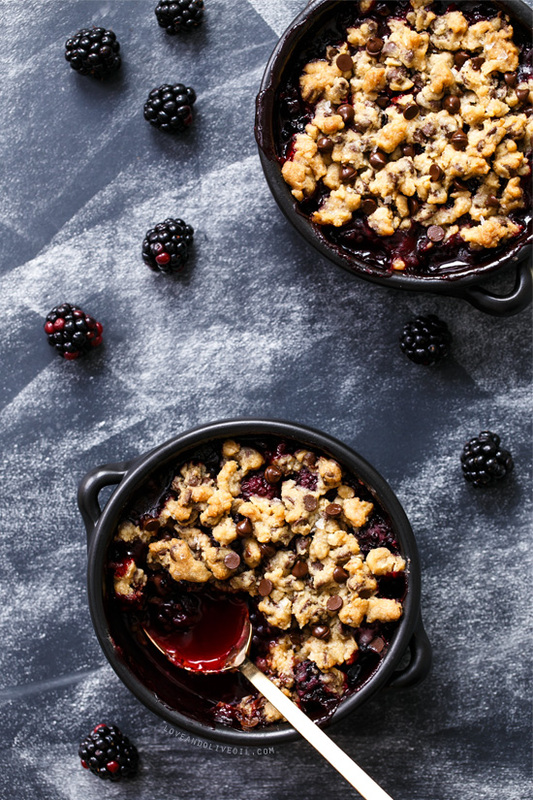 Generously crumble over top of blackberries. (You may not need to use all the topping, that’s ok, it’s basically an eggless oatmeal cookie dough so munch away!) Sprinkle with more chocolate chips (if desired) and flake sea salt. Bake for 30 to 35 minutes or until fruit filling is bubbling and cookie topping is light brown and crispy. Remove from oven and let cool for 10 minutes before serving warm with vanilla ice cream. The combo of berries and chocolate is awesome and I can see that one shot with the juice on the spoon, it’s chocolaty baked berry juice and that’s heaven right there! :) Pinned and want this! Cookie crumble? !…with blackberries?! This looks so good!! This is basically the kind of thing I dream up in my head when I can’t decide what i want for dessert. Heaven!! This is a genius idea! Cookie crumble. Fruit. I’m in love! Who says fruit and chocolate don’t pair well? This sounds amazing! loving this mash-up Linds, so creative!!! I think you chose the most accurate name for this, but no matter what you call it, it looks unbelievable! Fruit desserts are my favorite, but I also love chocolate chip cookies – I never thought to combine them! This looks great Lindsay. I love the idea of chocolate with berries. I’m in over my head with blackberries right now (they are like a weed in the PNW and take over every free space imaginable). This is on my “to-make” list! my goodness, this recipe looks amazing! it’s hard to find really good berries in texas (even now, during prime berry season) so i love recipes that give them a little oomph! Yum! I love your thinking outside the dessert box Lindsay! And PERFECT timing – blackberries are all around ready to be foraged here! You can call it whatever you want. This is just ridiculous! 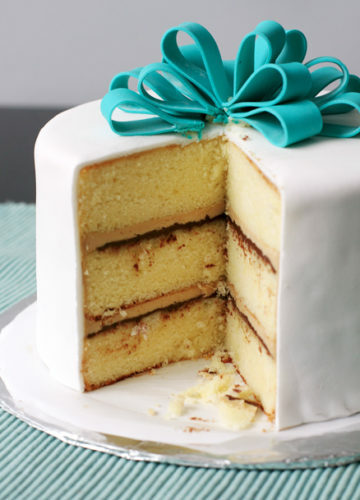 I want to eat it right now (it’s almost lunch time). I need to make this asap. Where can I find Flake sea salt? I am so very much in love with this. Fruity goodness topped off with chewy/crispy cookie pieces? Why has this not come into my life sooner!? 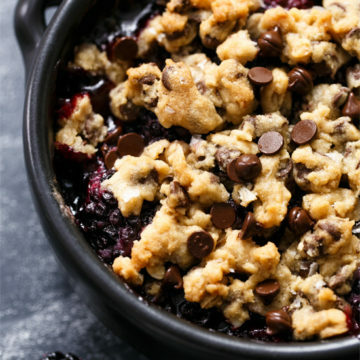 A chocolate and fruit cookie crumble in a skillet? I’m in! Yum-o! I could go for a bowl of this right now! 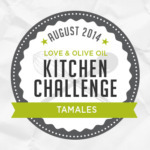 This recipe is brilliant, love it! yumm! this is definitely going to be made!! Is there any chance of getting high resolution photos you took of this recipe? 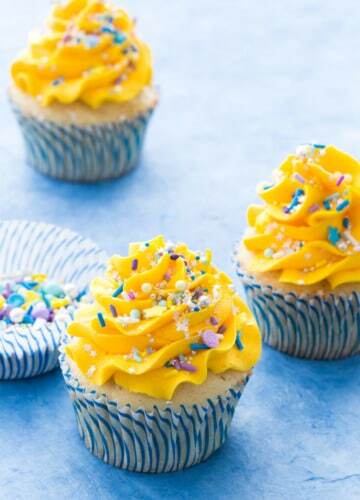 These photos are AMAZING, and make me lust to baking this. Oh I can’t wait to try this. Pinned! Your photos are gorgeous as always. omg. chocolate chip cookie crumble??? I’m in!! I so wish i’d had this recipe in the last few weeks. I’ve had sooo many blackberries in my CSA. This week we got melon instead, but I have some frozen berries so I’ll have to give this a try. It sounds so good! Cookies, crumble and fruit?! Absolute winner! I know this is special. One, I just had a form of blackberry cobbler as someone’s house last night. Fresh picked blackberries are luscious this time of year. 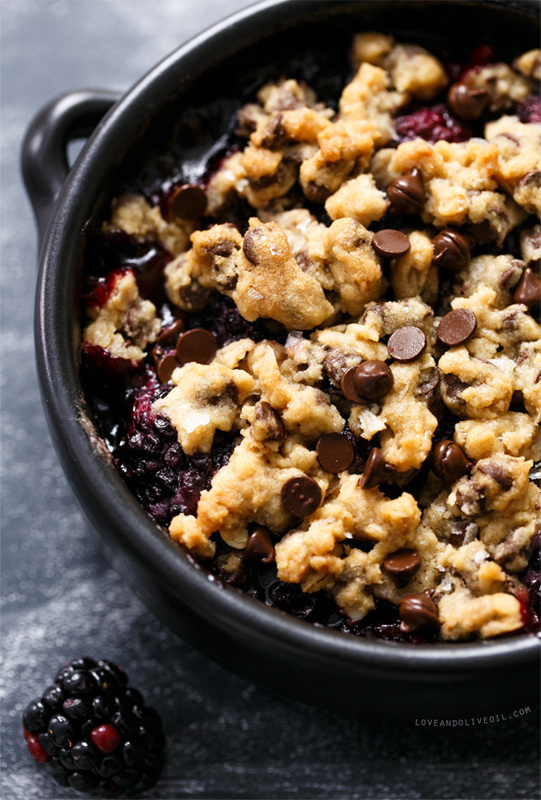 And two a couple of months ago, another blogger had chocolate chips in their blueberry crisp. I tried that out and was so impressed as were my guests. Not too many chips, so that the fruit was lost. 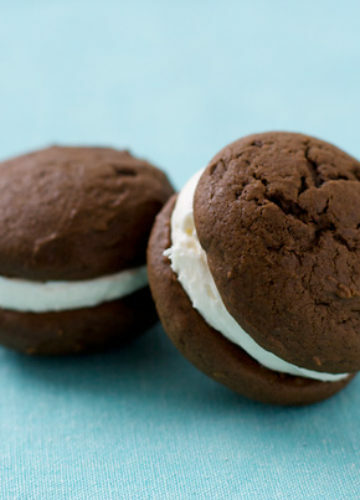 Like this recipe enough chocolate that is makes for a wonderful accent and surprise. 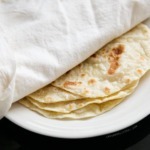 I am trying this recipe tonight! However, I don’t have any ramekins… Suggestions on how long to bake in a cake pan or 2 1/2 qt. casserole dish? Thanks! This is my kind of dessert! So awesome! ohh my goodness I absolutely LOVE this idea! Using the chocolate chips is awesome! Who doesn’t look chocolate with everything! Any chance we could get some higher resolution copies of these photos? The dish looks amazing, and the photos only make it that much more exciting. I’d love to use this as a wallpaper on a computer, tablet or phone. I also made this in an 8x8x8 pan because we don’t have ramikens and it worked wonderfully! Is there a way to reheat it if you’re bringing it to a party? Made a version of this last night. No ramekins here either, so I used a shallow dutch oven style casserole dish. We’re well past fresh berry season, so I used frozen. Also went with a Cherry Berry mix to satisfy everyone’s tastes. It was the perfect mix of sweet and tart. And everyone wanted more topping! Made this tonight and it was amazing! Plus, it’s a beautiful looking dessert, and would be easy to make for a dinner party! Thanks for a winning recipe, will definitely be making this again! 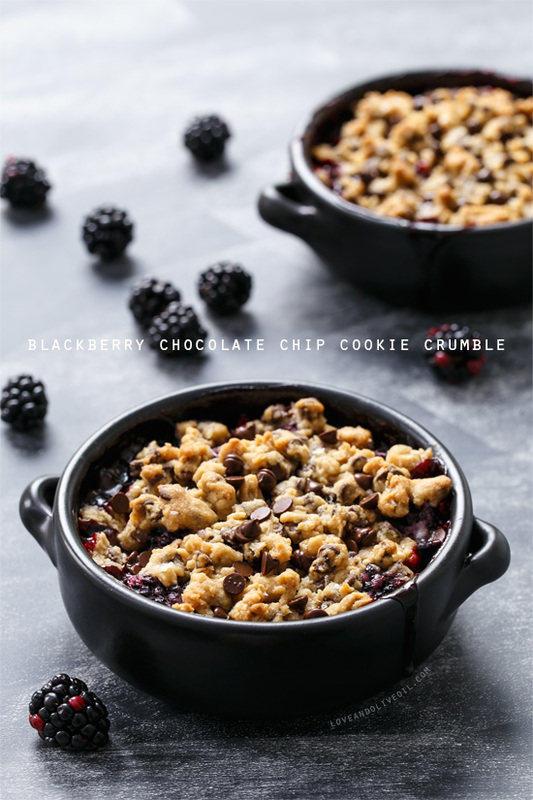 Love this chocolate chip cookie crumble idea! Blackberries are a fruit I don’t typically reach for. Usually it’s raspberries, cherries, or even strawberries. Love the lighting and color in the photos. This looks amazing! I don’t get fresh blackberries where I am, but how do you think it’ll work with frozen blackberries? My coworker made this for a pitch in yesterday. It was truly delicious! This was delicious! I made it last week with a mixture of blackberries + raspberries and it was excellent and am making it again tonight with blackberries + plums. I used a 8×8 square pan instead of ramekins and it still turned out great! Successful recipe! I didn’t have lemon juice, so I substituted lemon curd and cut the sugar in half. I will definitely make this again. 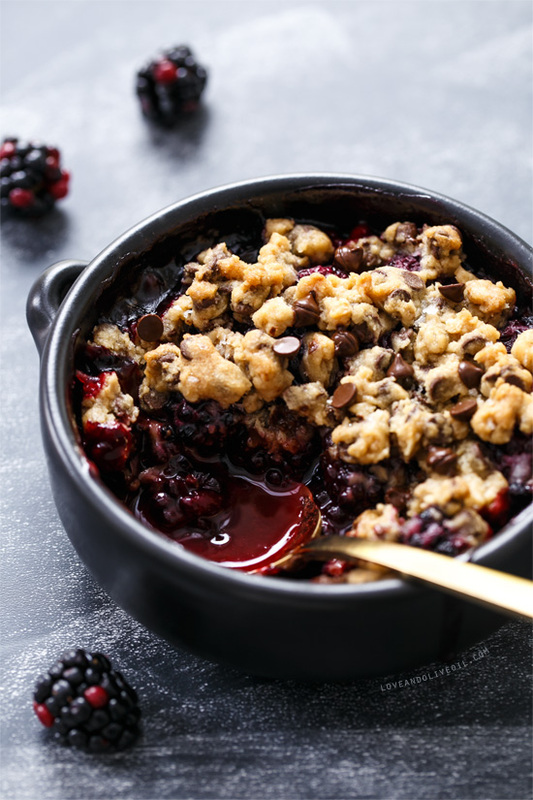 The addition of chocolate chips is a special twist on a traditional crumble. Made this double quantity in a large dish for a community event using the wild blackberries from the community. Wow! Best blackberry recipe! The addition of the chocolate chips really makes it. The dish went very fast. Oh so very GOOD!! I could make this every day, as long as I have blackberries. High in fiber, & such a delicious “blend”, with the chocolate chips?? ?